The family of Richard A. 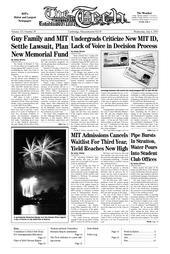 Guy Jr. ’99 has settled its wrongful death lawsuit against MIT outside of court, establishing the Rick Guy Fund to sponsor students in pre-orientation programs. Some students have vocally criticized the new designs for MIT’s personal ID cards, saying the cards inadequately represent MIT and are too cartoon-like. However, others have praised the design’s colorful style, which allows for easy identification among types of card users. The incoming freshmen class filled quickly this year, as MIT achieved a recent high of 67 percent yield on admissions. Water poured into parts of the fourth and fifth floors of the Student Center last Monday when the cap on a chilled water pipe ruptured, said Bernard Richard, manager of mechanical, electrical, and plumbing operations. Course X-B (Chemical Biological Engineering) and Course VI (Electrical Engineering and Computer Science) attracted an unusually large number of freshmen this spring, according to data from the Registrar’s Office. Committee Named to Select Dean for Undergrad. Ed. A committee charged with identifying candidates for the next Dean for Undergraduate Education has been appointed and will soon meet. The final output of the Student Advisory Committee to the Task Force on the Undergraduate Educational Commons was e-mailed rather than presented to the task force and leaves several questions unaddressed. The Tech has introduced a new internal editorial system with the publication of the July 6, 2005 issue. The system, based on InDesign and Smart Connection, replaces The Tech’s aging Quark Publishing System, and will allow much-needed improvements in the paper’s online presence, as well as its editorial processes. On June 27, Information Services and Technology increased the Webmail quota from 250MB to 500MB, said Theresa M. Regan, director of Operations and Infrastructure services for IS&T. The following incidents were reported to the MIT Police between May 5 and June 24. This summary does not include incidents such as suspicious activity, false alarms, general service calls, medical shuttles, or isolated incidents of theft. President Susan Hockfield reaffirmed MIT’s status as a beacon for international students and education efforts in a meeting with the Vietnamese Prime Minister Phan Van Khai on June 24. President Susan Hockfield has said she expects to name MIT’s next provost in mid to late July. An MIT alumnus will likely be the next president and chief executive of the National Association for the Advancement of Colored People. Bruce S. Gordon SM ’88 was unanimously selected by the NAACP Board of Directors at a June meeting. Contract negotiations are underway, and the selection is expected to be finalized by a board vote at the national NAACP convention, which begins this weekend. Three hundred gallons of oil spilled in the MIT power plant (Building 42) on June 27, said Director of Utilities Randall Preston. Massachusetts Institute of Technology (MIT) and the family of Richard Guy II are pleased to announce MIT’s establishment of the Rick Guy Fund. The fund is named for a former MIT student who died tragically on August 31, 1999. Guy is survived by his parents, Richard A. Guy Sr. and Janet V. Guy of Mission Viejo, California, and a sister, Suzanne, also of Mission Viejo, California. The Card Office recently announced that a $1.50 charge will be imposed for credit card TechCASH deposits made online. The Web site for online account management is run by a third-party company, which charges a MIT two percent commission for credit card deposits, said John M. McDonald, associate director of enterprise services.